It's time for another game of "would you rather," where you have to make the hard choices. This week, we explore the subject of certain death. You're chilling in your basement when two figures appear in front of you with a flash of light. One is Q, the prankster god from Star Trek. The other is the ghost of Yoda, the wise and humorous sage. The two of them offer you a chance to enter the sci-fi franchise of your choice, to be in the world of Star Trek or Star Wars for one hour. The only catch? You have to become either an Imperial Stormtrooper or a security officer (red shirt) aboard the Enterprise, guaranteed to die. Which would you choose? You can only choose one of the two. If you choose to be an Imperial stormtrooper, you'll be stationed aboard the Death Star, one hour before Luke Skywalker blows it up. If you choose to be a red shirt, you'll be stationed aboard the Enterprise one hour before you accompany Kirk, Spock, and McCoy to a planet of green, slimy alien monsters that are explosively turning people inside out. No matter which character you choose, you will die. You cannot change your fate: no sneaking off the Death Star or hiding in a Jeffries tube to avoid going on the away mission. 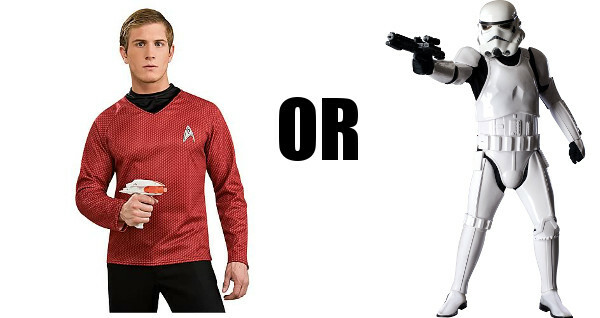 Would you be a red shirt or a stormtrooper? Vote now and let us know why in the comments. In that scenario can't I just stay home and not enter either universe? After some soul searching I decided to be a red shirt because at least then you're not all the same guy. It's slightly less depressing I think that way. ditto... i have a name, dammit! I chose an Imperial stormtrooper...this seems to be the less painful death. Unless I inadvertently cut Lord Vader off from the mens room and he Force chokes me! Red shirt - I'm dead.